These are the support pages for all ARM-Linux based products from taskit GmbH. Here you can download software updates and testing versions for the Linux kernel or rootfilesystem. The site will be extended to contain example programs and hands-on articles as well in the future. Also a forum will be open to registrated users to discuss issues regarding implementing of Hard- and Software for our products. At the end of Q3 2016, the DropA5D2 extends taskit's CoM portfolio. A fully-flegded Cortex-A5 core incorporating NEON, AES and a TRNG as well as 256 MB LPDDR1 fit on a size of 45 mm x 26 mm. As boot media, a serial flash and a SD card socket are mounted on the board. Access to the peripherals is provided by the 100pin FX8 connector. Low energy consumption is always our main focus: Thus the consumption in standby by full preservation of the memory content is about 1 mA with a wake-up time below 1 ms.
As our Lenny rootfs used on NanosG20 has become a bit stale, we now provide Debian Wheezy as an optional update. You can find the rootfs content here. To create your own SD card, please follow this tutorial. Don't forget to change them! StampA5D36With the StampA5D36 taskit introduces a new CoM (Computer-on-Module). 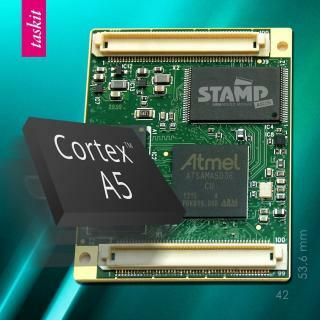 The Cortex-A5 ARM core with 528 Mhz, 256MB LPDDRAM and 256MB Flash enables demanding applications where low-power is decisive. The modules consumption can be lowered down up to 30 mW – ideally suited for mobile or self-harvesting systems. Due discontinued support of Ångström 2008 there are new root file systems for PortuxG20 and Stamp9G20 based on Ångström 2011.03 distribution. Both - SD card tarballs and JFFS2 images - are accessible through the download section. Public git repositories from taskit are now hosted on gitorious.org. 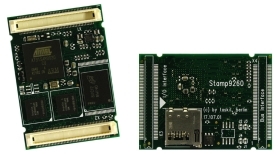 This includes at the moment the classic OpenEmbedded overlay for Stamp9G20 and PortuxG20 and the newly created OpenEmbedded Core overlay for the Stamp9G45. You can find these overlays including the new git urls here: http://gitorious.org/taskit. We have released an patch to support Stamp9261 and Panel-Cards on Linux 2.6.36. You can find it in our download section. Please read the release notes carefully. Support for Stamp9G20 and PortuxG20 has entered Linux mainline and is contained in the latest Linux release candidate (2.6.35-rc1). This means that from now on you can use newer kernel versions much easier than before. Where to download the latest kernel or OS?